A key component of get rich quick schemes is easy money making scams. It's all part of the myth that amassing barrels of money with little or no effort is possible. Claims of push-button success are part of it. If you've spent any time online, you've seen these easy money making scams. They can include schemes like "Make 1000s from home posting Google Ads," or "Get 1000s of back links to your site in 24 hours or less." Not only are such things a waste of time and money, they are destructive to any long-term plans you have for your site. Of course, that's why it was recommended that you create hundreds of these types of sites, because it was the only way to make it profitable. And the ONLY way to build all those 100s of miniblogs (who could?) is to buy their software! There is nothing wrong with a company that builds and sells software to assist people with their online endeavors. That's free enterprise. But putting people at risk for commercial gain is wrong. Then to attempt to overtake market share by manipulating search results after accusing an upstanding company of foul play, is downright dirty. It seems that everybody could use some extra cash these days. 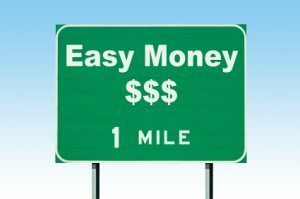 Easy money making scams are attractive to many because they sound like a dream come true. When people are out of work or feeling the effects of the bad economy, jumping in with both feet is tempting. It's easy to overlook the hallmark red flags that accompany the false claims. Unfortunately, new people can't always gauge between false, overblown claims and truly good products. That puts them at risk for losing time and money, which generates a lot of wheel-spinning, confusion and frustration. Sure, many products can help you build sites and help you build things quickly. Some say they can help you get lots of overnight links and get your site listed in scads of directories. But what about quality? And do these products actually lead to success? Training, support, tools and knowhow are the valuable tools everyone needs to succeed online. You can steer clear of easy money making scams by verifying claims. If it sounds too good to be true, AND if you cannot verify a product's results, you're best off to keep moving along. There are no shortages of opportunities on the Internet. A good rule of thumb: if claims of success are promised with little or no work, the product is probably one of the easy money making scams and not legitimate.